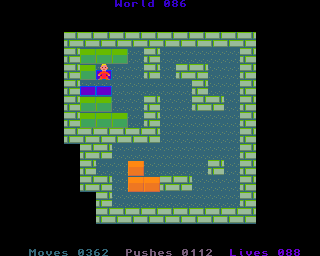 World eighty-six, unlike world eight-five is very hard stage with twelve normal boxes. Go RIGHT, UP, RIGHT and push RIGHT. Push DOWN, go UP, LEFT, LEFT, DOWN, DOWN, DOWN, RIGHT, RIGHT, RIGHT, RIGHT, RIGHT, UP, UP, LEFT and push UP. Push LEFT, LEFT, go RIGHT, UP and push UP. Go RIGHT, push RIGHT, go LEFT, LEFT, DOWN, DOWN, RIGHT and push RIGHT. Go LEFT, LEFT, UP, UP, RIGHT, RIGHT and push DOWN. Push LEFT, go DOWN, DOWN, RIGHT, DOWN, RIGHT, RIGHT, UP, UP, UP, UP, UP, UP, LEFT, UP, UP, LEFT, LEFT, LEFT, DOWN, DOWN, RIGHT, push DOWN and DOWN. Go LEFT, push UP, go RIGHT, UP, push LEFT, LEFT, LEFT, go UP, LEFT, push DOWN, DOWN, go RIGHT, DOWN, push LEFT and LEFT. Go RIGHT, UP, UP, RIGHT, RIGHT, RIGHT, UP, UP, RIGHT, RIGHT, RIGHT, DOWN, DOWN, RIGHT, DOWN, DOWN, DOWN, DOWN, DOWN, DOWN, LEFT, LEFT, UP, LEFT, UP, LEFT, push UP, UP, UP, go RIGHT, UP, push LEFT, LEFT, LEFT, LEFT, go UP, LEFT, push DOWN and DOWN. Go RIGHT, UP, RIGHT, RIGHT, RIGHT, DOWN, DOWN, RIGHT, RIGHT, DOWN, push LEFT, go DOWN, LEFT, push UP, UP, UP, go RIGHT, UP, push LEFT, LEFT, LEFT, go UP, LEFT, push DOWN and DOWN. Go UP, RIGHT, RIGHT, RIGHT, DOWN, DOWN, DOWN, RIGHT, DOWN, DOWN, RIGHT, DOWN, RIGHT, RIGHT, UP, UP, UP, UP, push LEFT, LEFT, LEFT, go DOWN, LEFT, push UP, UP, go RIGHT, UP, push LEFT, LEFT, LEFT, LEFT, LEFT, go UP, LEFT and push DOWN. Go RIGHT, RIGHT, RIGHT, RIGHT, RIGHT, DOWN, DOWN, RIGHT, RIGHT, RIGHT, RIGHT, DOWN, push LEFT, LEFT, LEFT, go DOWN, LEFT, push UP, UP, UP, go RIGHT, UP, push LEFT, LEFT, LEFT, LEFT, go UP, LEFT and push DOWN. Go RIGHT, RIGHT, RIGHT, RIGHT, DOWN, DOWN, DOWN, RIGHT, DOWN, DOWN, RIGHT, push UP, UP, go RIGHT, UP, push LEFT, LEFT, go DOWN, LEFT, push UP, UP, go RIGHT, UP, push LEFT, LEFT, LEFT, go DOWN, LEFT, push UP, UP, go RIGHT, UP, push LEFT and LEFT. Go RIGHT, DOWN, DOWN, RIGHT, RIGHT, RIGHT, DOWN, DOWN, RIGHT, RIGHT, RIGHT, RIGHT, DOWN, DOWN, push LEFT, LEFT, go DOWN, LEFT, push UP, UP, go RIGHT, UP, push LEFT, go DOWN, LEFT, push UP, UP, go RIGHT, UP, push LEFT, LEFT, LEFT, go DOWN, LEFT, push UP, UP, go RIGHT, UP and push LEFT. Go DOWN, DOWN, RIGHT, RIGHT, RIGHT, DOWN, DOWN, DOWN, DOWN, LEFT, DOWN, push RIGHT, RIGHT, go UP, RIGHT, RIGHT, RIGHT, DOWN, DOWN, LEFT, LEFT, push UP, UP, UP, go RIGHT, UP, push LEFT, LEFT, go DOWN, LEFT, push UP, UP, go RIGHT, UP, push LEFT, LEFT, LEFT, go DOWN, LEFT, push UP and UP. Go DOWN, RIGHT, RIGHT, RIGHT, DOWN, DOWN, DOWN, DOWN, RIGHT, RIGHT, DOWN, DOWN, DOWN, LEFT, LEFT, LEFT, LEFT, LEFT, UP, UP, UP, push RIGHT and RIGHT. Go DOWN, RIGHT, push UP, UP, UP, UP, go RIGHT, UP, push LEFT, LEFT, LEFT, go DOWN, LEFT, push UP, go RIGHT, UP, push LEFT and LEFT. Go RIGHT, DOWN, RIGHT, RIGHT, RIGHT, DOWN, DOWN, DOWN, DOWN, LEFT, LEFT, LEFT, DOWN, DOWN, DOWN, RIGHT, RIGHT, push UP and UP. Go DOWN, DOWN, LEFT, LEFT, UP, UP, UP, RIGHT, and push RIGHT. Go DOWN, RIGHT, push UP, UP, UP, UP, go RIGHT, UP, push LEFT, LEFT, LEFT, LEFT and LEFT. Go RIGHT, RIGHT, RIGHT, RIGHT, DOWN, DOWN, DOWN, DOWN, LEFT, LEFT, LEFT, DOWN, DOWN and push RIGHT. Go DOWN, RIGHT, push UP and UP. Go DOWN, LEFT, LEFT, UP, UP, RIGHT and push RIGHT. Go DOWN, RIGHT, push UP, UP, UP, UP, go RIGHT, UP, push LEFT, LEFT, LEFT, go DOWN, LEFT, push UP, go RIGHT, UP and push LEFT. Go RIGHT, DOWN, RIGHT, RIGHT, DOWN, DOWN, DOWN, DOWN, LEFT, DOWN, DOWN, LEFT and push UP. Go LEFT, UP, push RIGHT, RIGHT, go DOWN, RIGHT, push UP, UP, UP, UP, go RIGHT, UP, push LEFT, LEFT, LEFT and LEFT. Congratulations. You have completed world eighty-six. Get ready for world eighty-seven.